' fully qualified path of the selected file as a string.
' object, and works only in WSH, not in HTAs!
' myFilter is the file type filter; format "File type description|*.ext"
' use "On Error Resume Next" to prevent error messages.
' Requires NUSRMGRLib (nusrmgr.cpl), available in Windows XP and later.
' Default initial folder is "My Documents"
' Default file filter is "All files"
Additional options: objDialog.Filter = "MS Office files|*.doc;*.xls;*.pps|Text files|*.txt|All files|*. *"
Summarized: Works in Windows XP only. If used in HTAs, the initial directory must be specified. Doesn't work in any other Windows version. Summarized: Works in all Windows XP versions and in Server 2003. Doesn't work in Windows 95, 98, ME, NT 4, 2000 or 7, not sure about Vista. objIE.Document.Write "<HTML><BODY><INPUT ID=""FileSelect"" NAME=""FileSelect"" TYPE=""file""><BODY></HTML>"
Summarized: Works in all Windows versions. 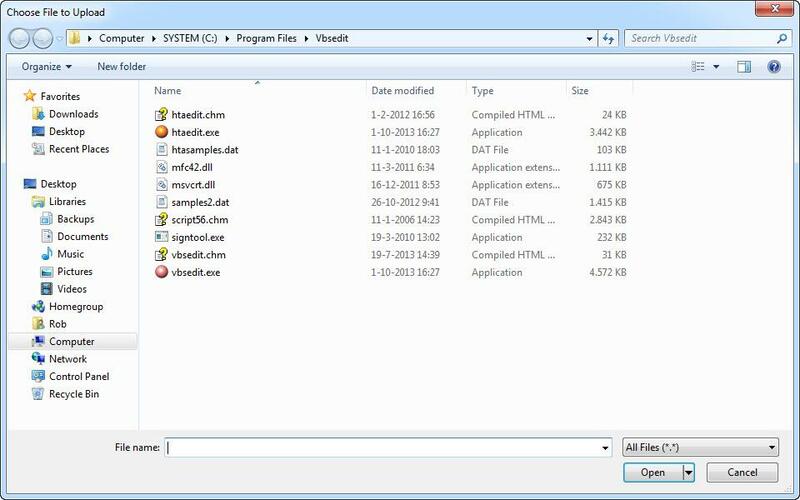 WScript.Echo """" & strFile & """"
' Features: Works in Windows Vista and up (Should also work in XP).
' All native code/controls (No 3rd party DLL/ XP DLL).
' Caveats: Cannot define default starting folder.
' Uses last folder used with MSHTA.EXE stored in Binary in [HKCU\Software\Microsoft\Windows\CurrentVersion\Explorer\ComDlg32].
' Dialog title says "Choose file to upload". & ".GetStandardStream(1).WriteLine(FILE.value);close();resizeTo(0,0);" & "<" & "/script>"""
Summarized: Works in Windows XP, Vista, Windows 7, Windows 8, Windows 8.1.